Up there next to Crash Bandicoot, one of Naughty Dog's most renown franchises is due to receive a third installment to its epic storyline on the first of November. Beginning with Drake's Fortune back in 2007, the Uncharted series has been well-received by the media and gamers alike. At PAX Prime 2011, Uncharted 3: Drake's Deception flaunted a playable demo of its multiplayer facets and a sneak peek at its single-player content on the showcase floor. The multiplayer demo utilized all of the single-player mechanics including its cover system, climbing, aiming, melee and everything else. In addition it featured “Power Plays,” in which a “marked man” is assigned on each team. Teams then try to kill the opposing team's marked man to earn extra cash. The customized characters in the demo looked promising, though we didn't get to experience the actual customization system. The models and textures also looked remarkable throughout the whole environment. Now, to turn attention toward the single-player presentation. The story kicked off with with protagonist Nathan Drake and lead female force Elena Fisher hustling toward a side gate which leads to a runway. Drake then of course, climbs over the gate as if it were nothing at all. Dialogue of affection and worry transpires between main character and his love interest, indicating that Drake has little time to complete his task, with a “one in a million” chance of success as always. Drake commands Elena steal a jeep and flee for safety, before he himself makes his way into danger. A handful of enemies are killed as the player makes his way around varieties of containers and runway-related objects toward a main gate. The enormous gate leading onto the actual runway slams shut just before the player is able to make their way through. They are then forced to guide Drake over the sheet-metal rooftops of storehouses, sniping and beating of enemies while taking cover whenever necessary. Upon reaching the runway where a plane is preparing for take-off. The as the player runs toward it, Elena shows up in the jeep to carry Drake closer to the aircraft. Once caught up, Drake grabs hold of the front wheel and is lifted up into the jet's compartment as the plane takes off. After a cut, Drake glances at his watch, then begins to crawl through a shaft below its fuselage covered by some metal grating. A large soldier notices him, lifts the grate, pulls Drake out by his ankles and pins him against the steel wall of the plane's interior. The player is then forced into melee combat with the massive soldier as he holds Drake stationary. Moments later, the man pulls a lever, releasing the ramp in the back of the craft as to toss Drake out. Drake causes a crate to slide out from under a stack, knocking the solider into his trap. This results in a chain reaction leading to all of the cargo to fly out the back of the plane, and soon a train of large military vehicles covered by nets as the player fends off more armed soldiers. Drake soon looses his footing and is launched from the plane's backside, but catches hold of the netting covering the chain of vehicles which are hanging from the aircraft. The player must then climb back toward the plain while being shot at by riffles and rocket launchers just before the exclusive showcase ends. Both the gameplay and storyline look absolutely astonishing. Very little of it is cutscene, as it heavily implements quicktime events and rails during these story-driven segments. The voices and music also blew us away. 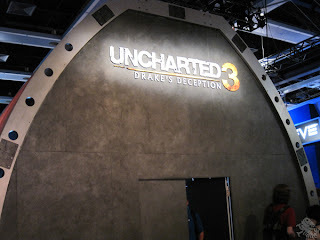 Uncharted 3: Drake's Deception exhibits promise worth getting excited about. While the multiplayer aspects are good, they bring only improvements to that of Uncharted 2: Among Thieves. 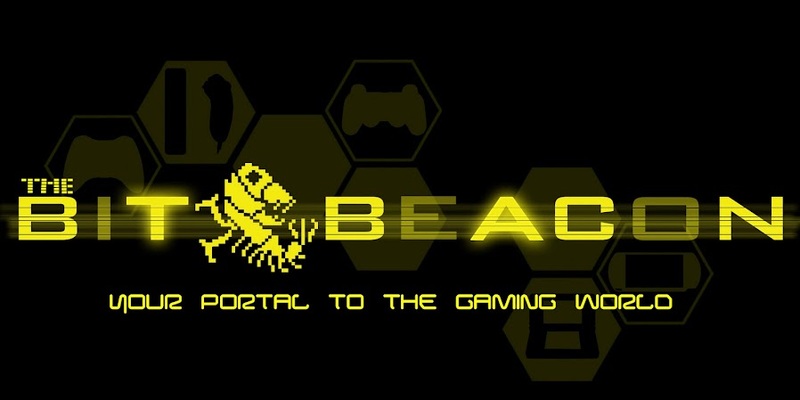 The single-player mode on the other hand, looks to brings a whole new level of engagement between the player and the game from what the previous installment offered. 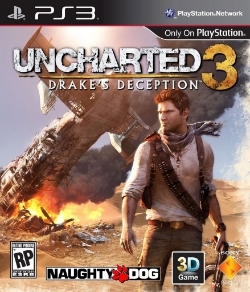 We look forward to purchasing our copy of Uncharted 3: Drake's Deception on November 1, 2011.